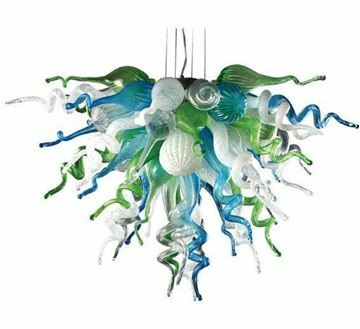 A beautiful array of Aqua, Lime Green, Clear, and Opaline glass shapes combine to make this dramatic chandelier. Available in four different sizes. Uses brilliant low-e LED bulbs. Please see the Overview Section below for schematics on all the available configurations. This item comes ready to install requiring direct wiring into a junction box. Foster's strongly recommends having a certified electrician. The drop from the ceiling height can be adjusted between as little as 1' to a maximum of 8'. 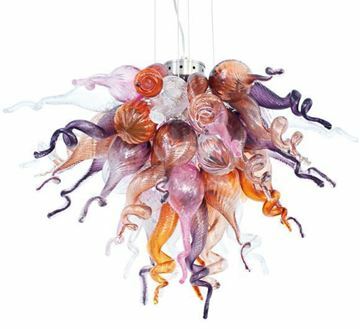 A beautiful array of Purple, Clear, Copper, Light Red, and Pink glass shapes combine to make this dramatic chandelier. Available in four different sizes. Uses brilliant low-e LED bulbs. Please see the Overview Section below for schematics on all the available configurations. This item comes ready to install requiring direct wiring into a junction box. Foster's strongly recommends having a certified electrician. The drop from the ceiling height can be adjusted between as little as 1' to a maximum of 8'. 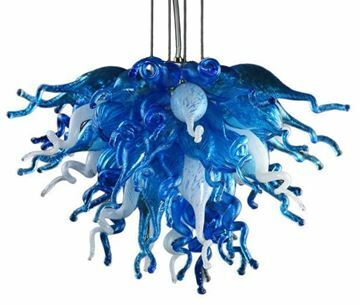 A beautiful array of Clear Glass, Cobalt, Sky Blue, and Blue Grey glass shapes combine to make this dramatic chandelier. The beautiful color gradient of this design flows from deep cobalt blue at the top to crystal clear at the bottom. Available in four different sizes. Uses brilliant low-e LED bulbs. Please see the Overview Section below for schematics on all the available configurations. This item comes ready to install, requiring direct wiring into a junction box. Foster's recommends having a certified electrician do the wiring. The drop from the ceiling height can be adjusted between as little as 1' to a maximum of 8'. 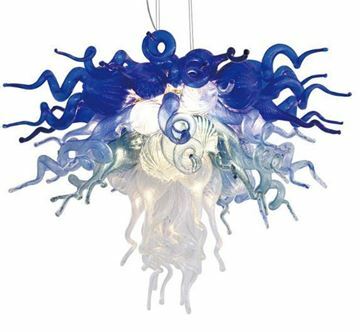 A beautiful array of Aqua, Cobalt, and Opaline glass shapes combine to make this dramatic chandelier. Available in four different sizes. Uses brilliant low-e LED bulbs. Please see the Overview Section below for schematics on all the available configurations. This item comes ready to install, requiring direct wiring into a junction box. Foster's strongly recommends having a certified electrician do the wiring. The drop from the ceiling height can be adjusted between as little as 1' to a maximum of 8'. 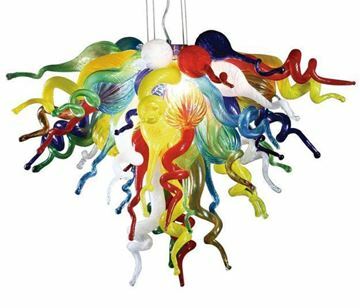 A beautiful array of Aqua, Cobalt, Purple, Opaline, Lime Green, Orange, Red, Yellow glass shapes combine to make this dramatic chandelier. Available in four different sizes. Uses brilliant low-e LED bulbs. Please see the Overview Section below for schematics on all the available configurations. This item comes ready to install requiring direct wiring into a junction box. Foster's strongly recommends having a certified electrician. The drop from the ceiling height can be adjusted between as little as 1' to a maximum of 8'.